We are just 3 days away from the LG G3 unveil, atleast we are sure of what device it is and the dates as confirmed by LG in teaser and the LG Quickcircle Case. What LG didn’t provide are the device specifications as yet, but these have not been scarce as it’s currently the most open secret yet, after the Huawei Ascend P7. Outside of the leaked press shots, including different colours and angles, we now have an actual photo of the opened back that reveals more. 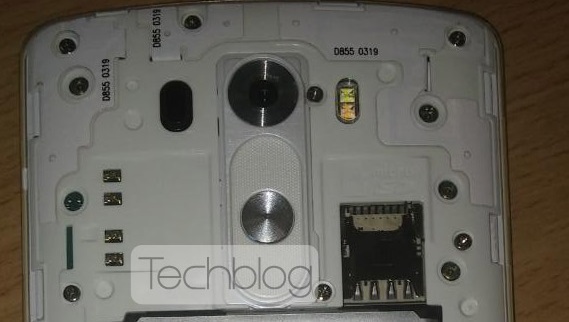 The open back shows the microSD slot, MicroSIM slot and a 3000mAh Li-Ion battery. This goes to say, as we had expected LG G3 to don expandable storage, there won’t be anything on the sides of the device as the buttons were pushed to the back from the times of the LG G2. Nothing here indicates that we will have any form of waterproofing on the device but we can see the NFC tags, camera, flash and what we have come to believe is a laser sensor to assist the camera in fast focus. The bottom reveals that the microUSB slot will be at the bottom leading to an assumption that the sound out jack will be at the top.